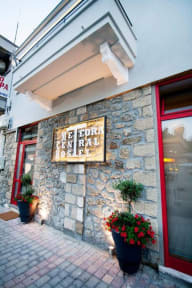 New boutique Hostel in the heart of Kalambaka. Brand new beds and furniture in a totally renovated traditional house, original built on 1950! The Meteora Central Hostel is a very friendly place to stay. Runs by a family who also own the cafe bar right next door. Views to Meteora rocks and a small green backyard perfect for an evening coffee or a night BBQ. 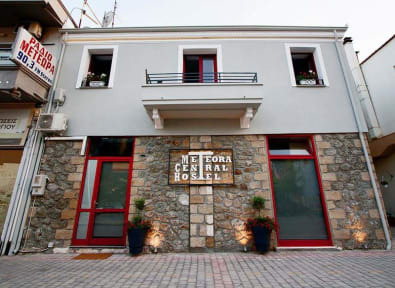 Right in the heart of Kalambaka, the Meteora Central Hostel has the best location ona can have. Only 400 m away from the train station and right across the bus station for Athens or the Meteora rocks, is the perfect place for all travelers. Bars, cafes, restaurants and a supermarket are within 5 min walking distance. Our place is a boutique hostel located in a fully renovated traditional building. Everything inside is brand new and stylish. In the ground floor there is a spacious 8 beds bedroom, a private twin room with its own bathroom and a living room with a small kitchenette making it ideal place to relax after a full program day. In the upper floor there are 3 big, 6 beds, bedrooms and 3 bathrooms. Every bed has its own light and electric socket. All of the rooms are have air condition units. There is also a backyard ideal for your breakfast or your coffee or even a BBQ. Reception is open from 07:00 till 24:00. Fantastic place to stay in Meteora. The owner was extremely inviting and helpful in recommending places to eat and the best ways to visit the monasteries. The ideal hostel experience. This was one of the best hostels I’ve ever been in. Well organized, delightful and helpful hosts. Amazing value—do it. AMAZING stay!! Came during the off season and the weather was lovely, literally located on myloplatas beach. It’s a short walk or bus ride into the village, where in high season there are parties around the clock. But in the off season it is quiet, almost like our own private island, and the locals are very welcoming. Petros was fantastic and made our stay very intimate, and something really special. He will take great care of you, I couldn’t recommend Nissos more. Great hostel perfectly located. The owners are very nice too. Comfy beds and a clean place. Perfect distance for the train station and right in town. First stay in a hostel. Owners were very nice. Staff was pleasant. The rooms were nicely updated. Everything was clean. Very happy with the experience and would absolutely recommend. Perfect spot for budget traveler visiting Meteora. The couple who run the hostel were exceptional! Their general help in directions and advice was great and when I began to feel ill they went above and beyond to help me recover quickly. Highly recommend! Thank you both so much for your care and compassion while I was feeling sick! A very nice place. You can tell the owners care very much about the hostel and the guests, also they were super helpful explaining the surrounding area. Probably the most helpful hostel owners I have ever met. Would definitely stay again. This hostel is wonderful! The beds are huge, with big locked storage area underneath and it’s super close to the station and the bus that goes to the monasteries. Bathrooms very clean. Kitchen not huge, so could potentially be busy, but wasn’t while I was there. I wanted to stay longer at Meteora just for this hostel. Security wise I would have liked to be able to lock both the outer door and the room door.